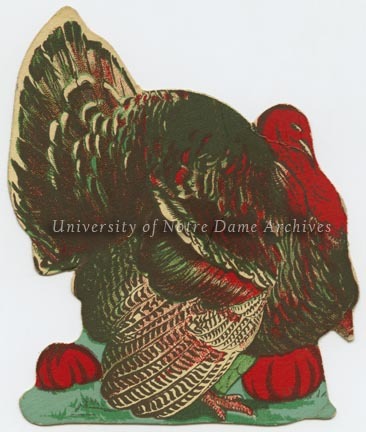 In the early 1880s, the Notre Dame faculty and administration were discussing a way to engage American Catholic lay men and women with the hierarchy of the Church. University President Rev. Thomas Walsh, Rev. 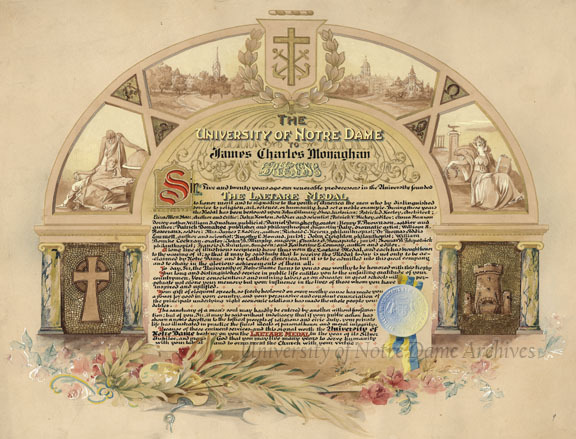 Edward Sorin, and Professor James Edwards decided that Notre Dame should bestow a medal of honor each year on an American lay Catholic member, preferably a college-educated “man of letters,” in similar fashion as the Vatican’s Golden Rose. The Laetare Medal quickly became not only the highest honor Notre Dame bestows, but also the highest honor American Catholics can receive. As the medal was initially presented on Laetare Sunday, the fourth Sunday of Lent, the medal was known as the Laetare Medal. 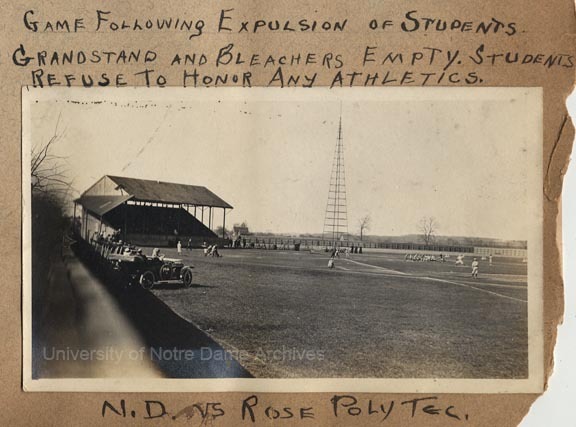 Notre Dame administrators or a delegate usually presented the medal to the recipient away from campus. As time grew on, the presentations floated further away from Laetare Sunday to accommodate the recipient’s schedule, but the announcement is still made on Laetare Sunday. Front side of the Laetare Medal given to Albert Zahm in 1925. Astronaut James Wetherbee (Class of 1974) carried this medal with him on his first flight into space aboard the Columbia space shuttle in 1990. John Gilmary Shea was the first recipient of the Laetare Medal in 1883. Artist Eliza Allen Starr, dear friend of Rev. Edward Sorin, was the third recipient of the Laetare Medal and the first female recipient in 1885. Edward Pruess accepted the 1887 medal under anonymity, not wanting public honors. It wasn’t until after his death that his name was added to the honor roll. In the early years, an illustrative announcement accompanied the medal. This practice ended in 1908 on the Silver Jubilee of the Laetare Medal. Each medal has a unique design, reflecting an important aspect of the recipient’s life. For example, aviation pioneer Albert Zahm’s (Class of 1883) medal features an airplane and the Golden Dome (see above) while President John F. Kennedy’s medal features the Presidential Seal of the United States. 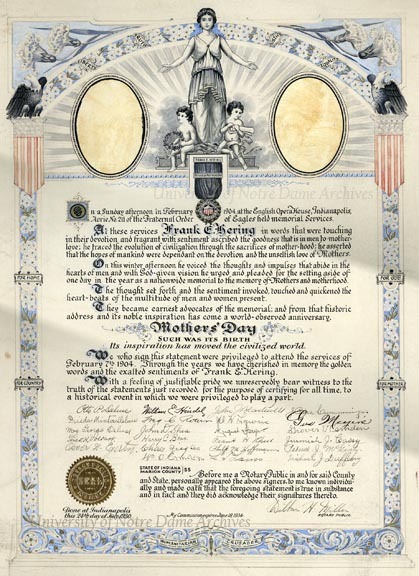 Laetare Medal certificate to James Charles Monaghan, 1908. Artwork by Howard Darnell of Philadelphia. For decades, Notre Dame administrators, usually accompanied by the local bishop or other Catholic hierarchy, would bring the medal to the recipient. Usually the ceremony was simple, but other times it was a lavish affair. In 1911, former Notre Dame professor Maurice Francis Egan, who was then service as the United States Ambassador to Denmark, was awarded the Laetare Medal. Notre Dame invited dozens of dignitaries, including cabinet members, congressmen, high-ranking military officials, and foreign ambassadors to the presentation ceremony. 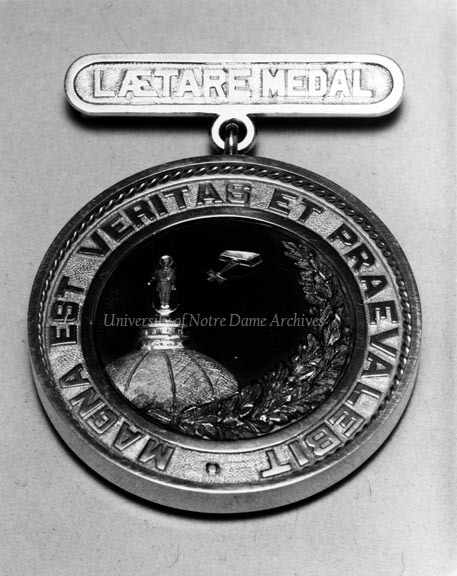 For the Golden Jubilee of the medal in 1933, the presentation was held at Notre Dame’s Commencement. All living medalists were invited and among those who returned to campus to speak were Margaret Anglin, Al Smith, and Dr. James J. Walsh. Rev. Edmund Joyce, CSC, and Rev. 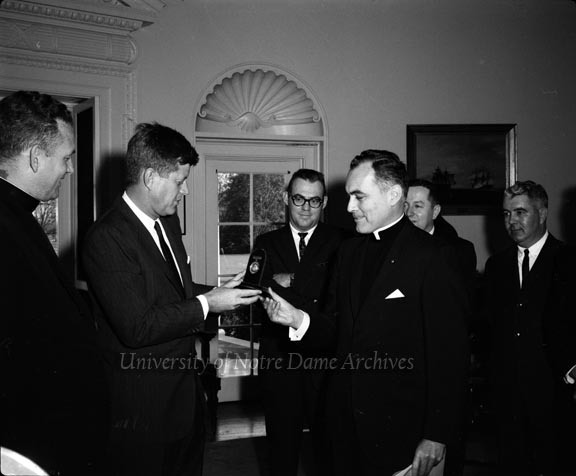 Theodore Hesburgh, CSC, presenting President John F. Kennedy with the Laetare Medal in the White House, 1961/1122. In 1968, the Notre Dame search committee opened up the requirements of Laetare Medalists to include clergy, not just lay people. The first religious Laetare Medalist was Rev. John O’Brien, a Notre Dame faculty member and popular author. Notre Dame has also awarded the Laetare Medal jointly to married couples and groups. By the 1970s, the presentation of the Laetare Medal became a regular part of Commencement Exercises, and the medal recipient is one of the principle speakers. In 2006, Laetare Medalist jazz musician Dave Brubeck also graced the audience with a performance of “Travelin’ Blues” (see video below). In 2009, Mary Ann Gleason declined the Laetare Medal in protest to Notre Dame’s decision to name President Barack Obama as Commencement speaker and award him an honorary degree. Commencement – Rev. 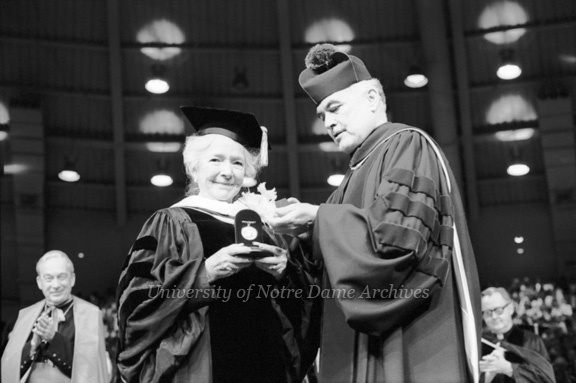 Theodore M. Hesburgh, CSC, presenting Helen Hayes with the Laetare Medal, 1979/0520. [Laetare Medal Centennial: 1883-1983, PNDP 40-La-01].